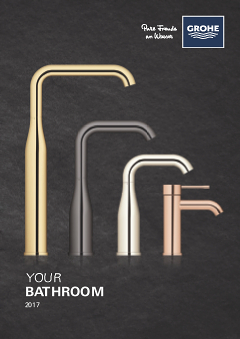 Crafted in a minimalist design of fluid shapes, the GROHE Euphoria Cosmopolitan range blends in perfectly with all modern bathroom environments. Mounted flexibly on a ball joint and with a diameter of 180 mm, this head shower will add new appeal to your bathroom. With the integrated GROHE EcoJoy technology, you will automatically save water on every shower. Thanks to our SpeedClean anti-lime system, a quick wipe is all it takes to remove any limescale residue from the silicone nozzles. The lustrous GROHE StarLight chrome surface is also super easy to clean. Combined with the soothing Rain spray, the GROHE DreamSpray technology ensures an even flow from all nozzles, turning your shower into a perfect, revitalizing experience.